FTC Disclosure:I am a member of the Collective Bias® Social Fabric® Community. This shop has been compensated as part of a social shopper insights study for Collective Bias® and ALLEGRA® #cbias #SocialFabric. All opinions are my own. Seasonal allergies have attacked my entire family. 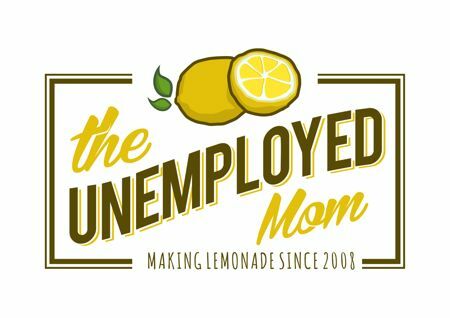 For the past 6 weeks or so, we have all been miserable. We have had numerous doctor visits and gone through a ton of allergy medications. My poor son walks outside and sneezes nonstop. It even happens on the t-ball field and impacts his focus. I am a runner, so running outdoors with allergies can be pure agony (especially when I pass by areas with tons of flowers, talk about an attack)! 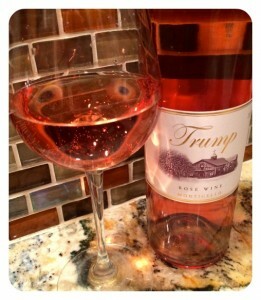 Living in Florida, something is ALWAYS in bloom so we need a product to help us cope. For the first time in my life I had allergic conjunctivitis in both eyes! Talk about stopping my life, I was mortified to go in public so I wore dark sunglasses everywhere. It was pure agony and embarrassing. 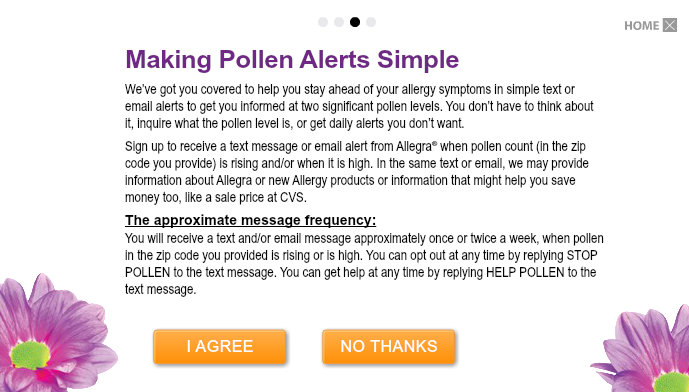 I have never had allergies this bad so I started interacting with Allegra’s new microsite MyAllergenius.com for help! This site is a valuable resource for seasonal and/or year round allergy sufferers. I was able to sign up for pollen alerts so I can prepare for potential allergy issues. I opted for email alerts, but they also have text alerts. Typically, I wait until my head is pounding and I’m sneezing nonstop to check the pollen count, but now I will receive a message alerting me of significant pollen levels and changes in my zip code. This will help my family take precautions so we don’t have allergy attacks. I spent a long time studying the website and educating myself on allergy triggers, steps to reduce indoor allergies, how Allegra compares to other OTC products, and downloading coupons to save money! What immediately made me smile was the fact Allegra acts fast and provides relief that is non-drowsy. I also learned that Allegra is powerful enough to provide relief when pollen levels are off the chart. That’s impressive for an OTC medicine because I have not found that type of relief with my current allergy tablet. 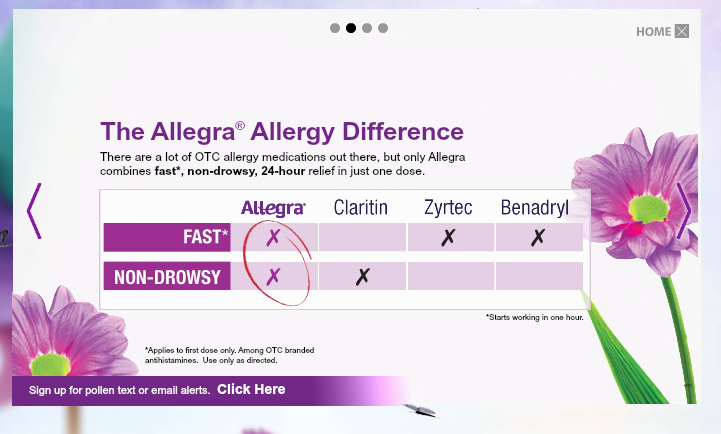 Allegra Allergy is prescription strength yet available OTC, so it’s time to make the switch! I have heard such amazing feedback about Allegra products from my doctor, family members and friends so I knew it was time to give it a try. To be honest, cost has been a factor but at this point, we need the best products on the market to provide relief. Plus when I add up the cost of using the “other guy” allergy tablet plus a separate decongestant when necessary, the costs are similar. 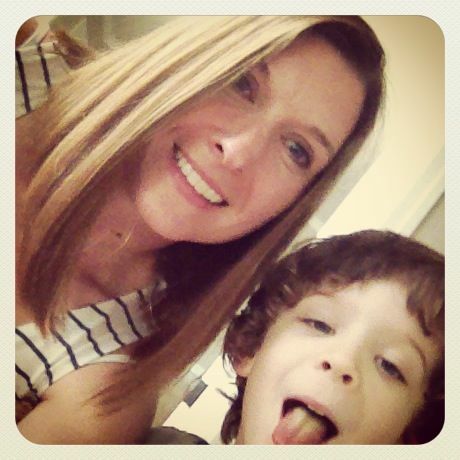 My son is 5, so he will need children’s liquid Allegra. He currently takes a daily liquid allergy, but it doesn’t seem to be helping him. I honestly think he is immune to it. Plus, I do not like the drowsy effect it has on him. 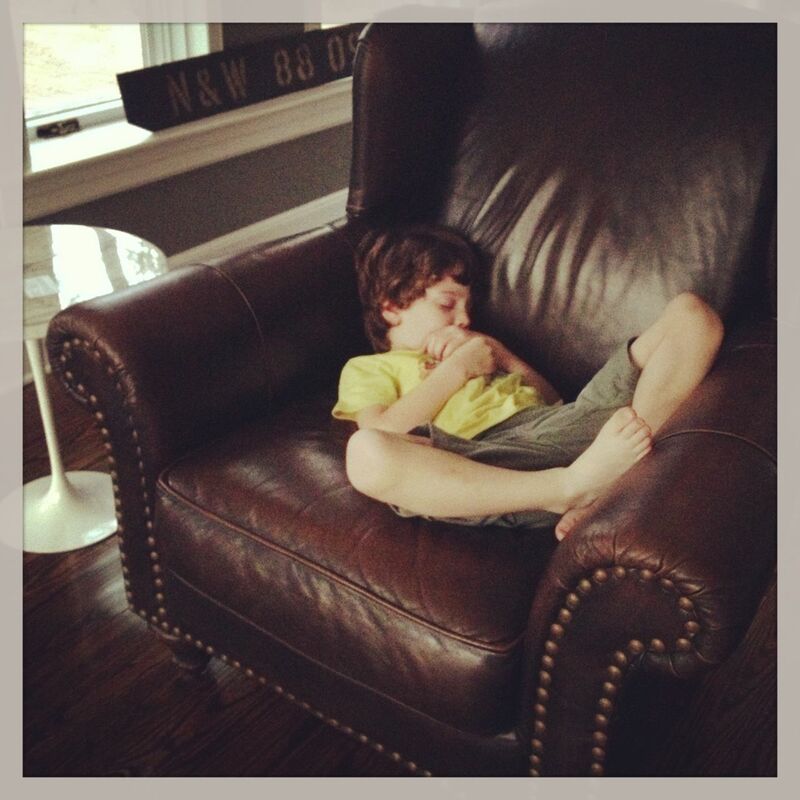 Check out the photo below, I snapped it after he took a different allergy medicine the other week. The website helped me compare the two children’s products to know which was right for him (orally disintegrating tablet versus liquid). The tablet is for children ages 6-12 while the liquid is for ages 2+. Recently, I have found myself to be extremely congested so I was happy to see Allegra also has a product with a decongestant (Allegra-D), so I will be picking that up as well. I think having a nice assortment of Allegra Allergy medicines on-hand will benefit my entire family, we can all reach for the best weapon to combat our allergy ailments. To say I was excited to go to CVS and shop for Allegra is an understatement! I was on a mission to find the aisle with the purple boxes! 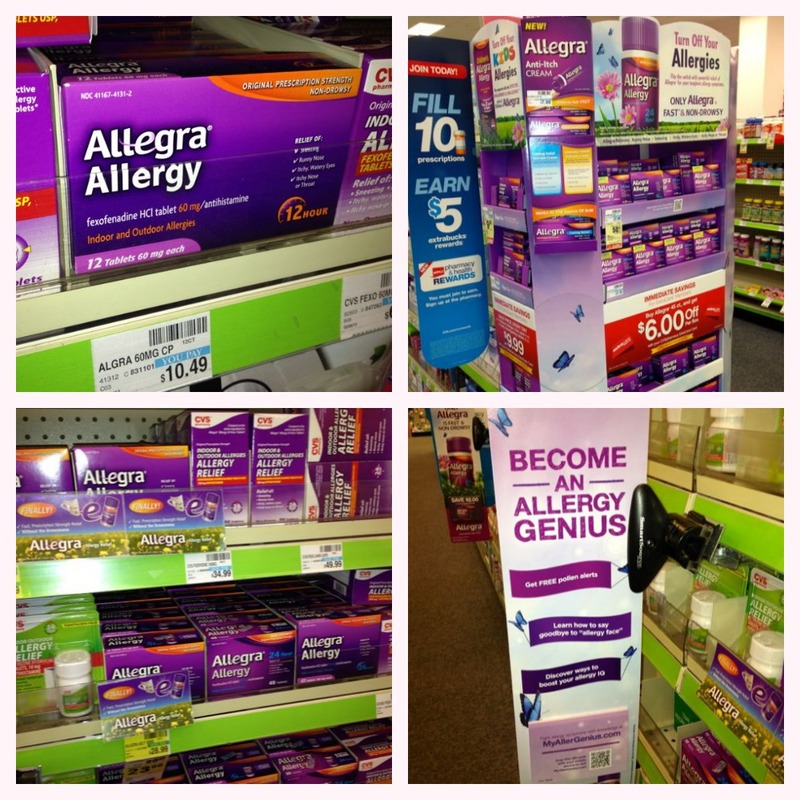 It wasn’t tough to locate Allegra, my local CVS store had Allegra end caps, displays and advertising everywhere. Plus, the pharmacist communicated that Allegra is an effective OTC allergy medicine. You can see my entire CVS path to purchase google+ album here. Does Allegra make a difference? YES! After using Allegra, we are ALL seeing a significant difference! None of us feel fatigued after taking the product and best part of all, our allergies are being managed! As advertised, Allegra provides fast acting relief so we are able to enjoy our normal outdoor activities! 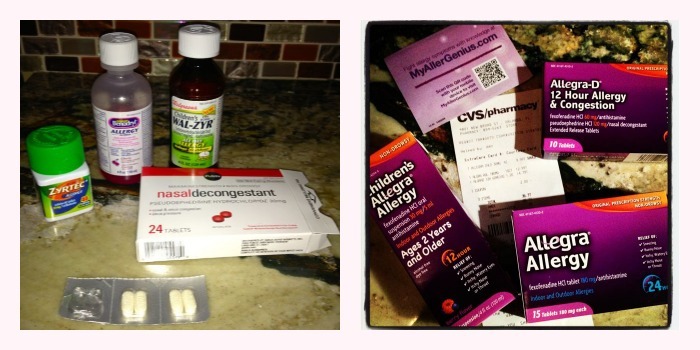 We replaced our collection of old allergy medicines (see below) with the new Allegra products I purchased from CVS. We are all smiles after using Allegra! No more sneezing, runny noses, itchy throats, etc. Going outside is fun again. 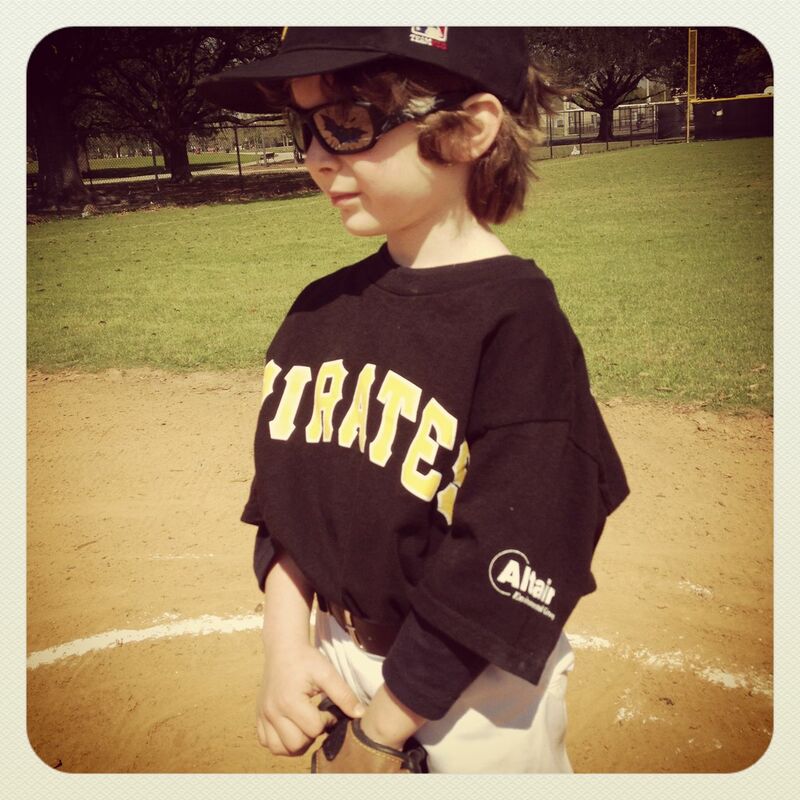 My son can focus on t-ball again and not feel miserable or drowsy while on the field. Save money at CVS! 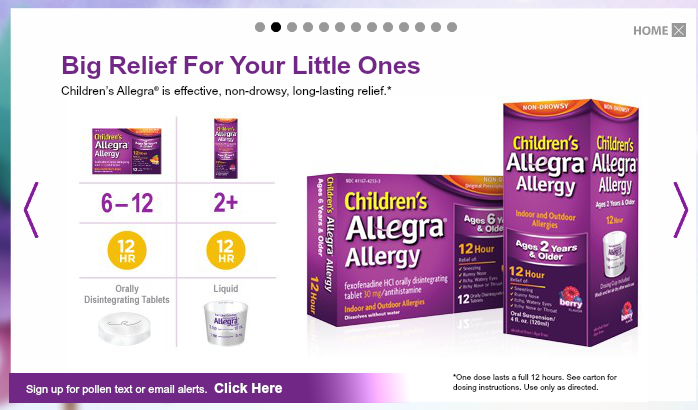 If you plan on purchasing Allegra, CVS has $6 off Allegra 45ct and $9.99 for Allegra Children’s tablets or liquid. Sale prices are valid through 5/31 with your CVS Extra Care card. Also, download a coupon for $4 off 30ct and larger ($23.99 before coupon) and $2 off children’s and the smaller sizes from www.myallergenius.com. Join the Allegra Party! Learn tips to beat seasonal allergies and win big! 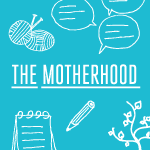 Mark your calendar for a Twitter Party on May 14th from 1:00 to 2:00 PM EST! You can RSVP here. Stay informed! Follow Allegra on Twitter and Facebook!